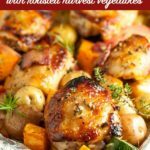 Fresh herbs and smoky bacon flavour this dinner of Sheet Pan Chicken and Roasted Harvest Vegetables. Crispy chicken and roasted vegetables make a complete meal, made in one pan, baked in just 30 minutes. 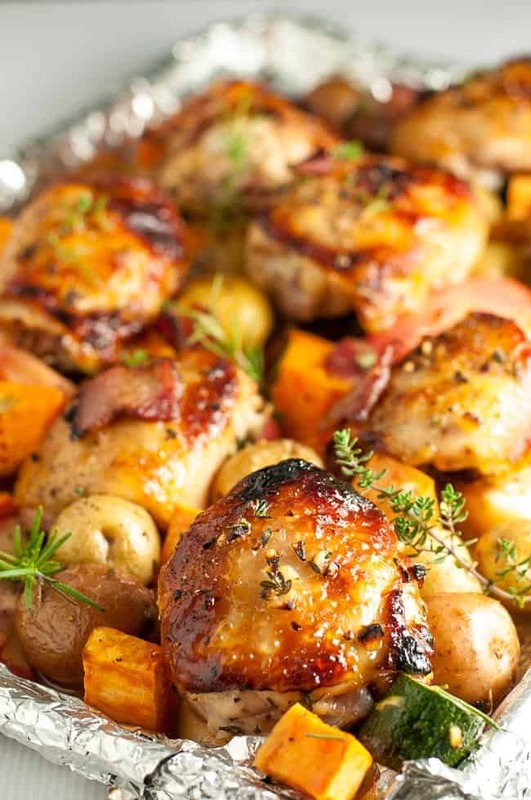 One of my favourite meals to make in the fall has been Harvest Chicken with Bacon and Rosemary. It’s a one pot meal, bursting with flavour. But in my seemingly never-ending goal to make the easiest dinners possible, I adapted that recipe and made it even more simple. This Sheet Pan Chicken and Roasted Harvest Vegetables was the result. It’s all baked on, you guessed it: one pan. 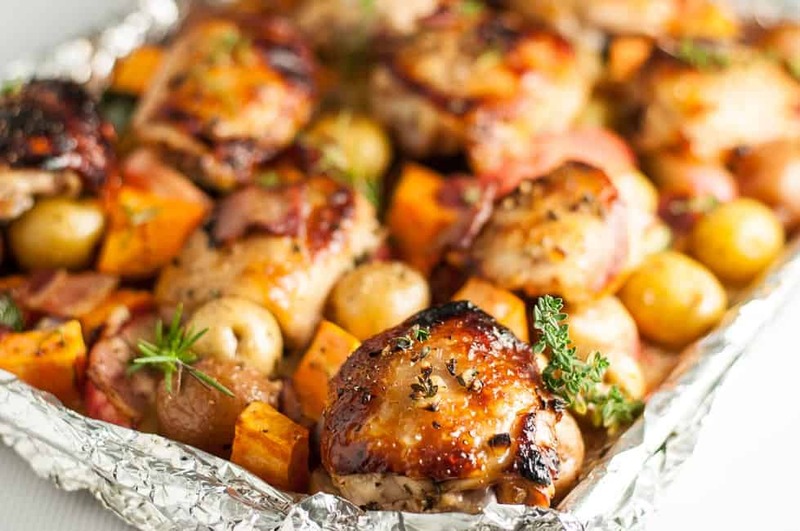 This sheet pan chicken looks like a hot mess, and that’s exactly what it is! 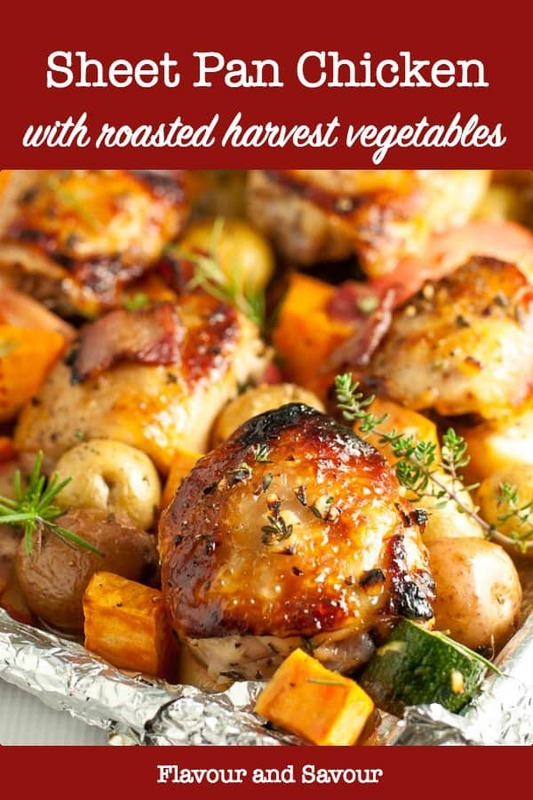 Harvest vegetables, tossed on a sheet pan, drizzled with oil and herbs and topped with chicken and bacon. Believe it or not, it all turns out evenly cooked in 30 minutes. The trick is to bake it at a high heat and chop all the vegetables the same size. Make sure you don’t slice the apples too thinly, or they’ll become too soft in the oven. 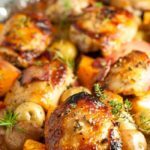 I used chicken thighs for this tasty recipe and they were perfectly seasoned and juicy with crispy, nicely browned skin. Roasted tiny potatoes, sweet potatoes, zucchini, shallots, and thick chunks of sweet apple made a beautiful coloured array of fall vegetables. We loved the contrast of salty bacon and the sweet Honeycrisp apples that we had picked up at the farm just down the road a few hours earlier. Just make sure you cut them in uniform sizes so they will cook at the same rate. Use dense root vegetables if you’re using bone-in chicken as it takes longer to cook than boneless chicken. And if you like easy sheet pan dinners like this Sheet Pan Chicken, you may like these too! Loaded Sheet Pan Nachos. Enjoy! 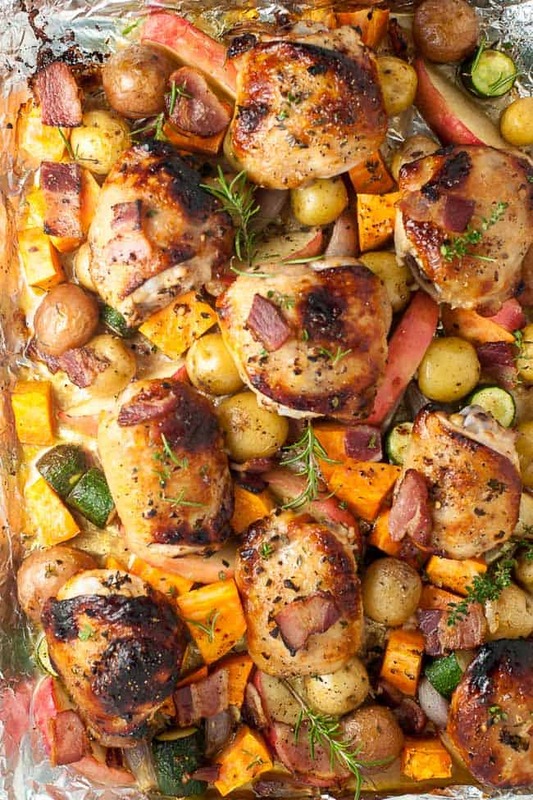 This Sheet Pan Chicken and Roasted Harvest Vegetables supper is flavoured with fresh herbs and smoky bacon. Crispy chicken and roasted vegetables make a complete meal, made in one pan, baked in just 30 minutes. Whisk marinade ingredients together. Pat chicken dry and place in a Ziplock bag. Pour marinade over all, close bag tightly and massage the marinade into all the chicken pieces. Set aside. 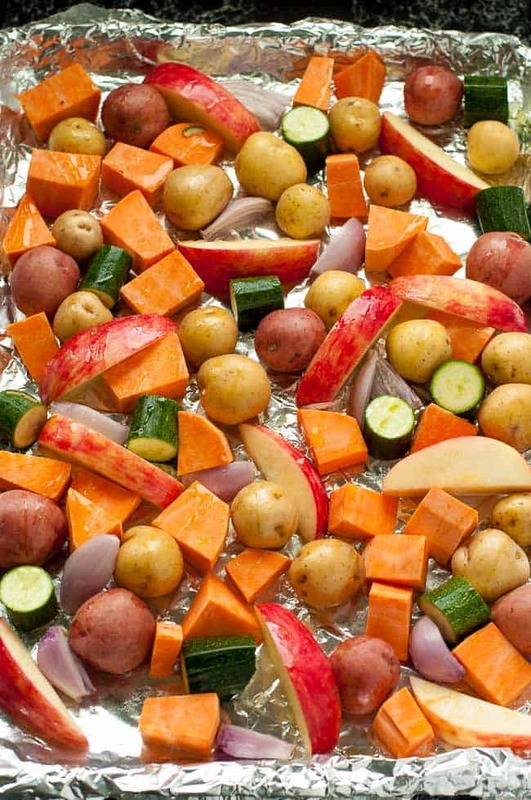 Prepare a large sheet pan (with sides) by either lining it with foil or lightly coating it with oil or cooking spray. Chop vegetables so they are of uniform sizes. Leave apple unpeeled, remove the core and slice into 3/4 inch chunks. If they are thinner, they cook too quickly and become too soft. Arrange vegetables on sheet pan. Drizzle with olive oil and sprinkle with salt and pepper. Chop bacon into 1-inch pieces and arrange randomly on the vegetables. Place chicken pieces on top of the vegetables and drizzle with remaining marinade. Bake at 425°F for 30 minutes or until chicken registers at least 165°F on a meat thermometer. 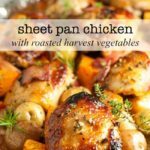 I’ve been really into sheet pan dinners lately, and this recipe is perfect for the last of my garden produce! Me too! They’re so easy, it almost feels like cheating! This looks so delicious! Will be making this soon! Love that it has apples! The apples were a great addition to this easy meal. They added a welcome sweetness that contrasted with the bacon. Thanks for stopping by! This was very easy! I used yams, parsnips, zucchini, onion, apples, carrots and whole garlic cloves. I left out the bacon, as I didn’t have any, and it was still delicious … although I did think an awful lot about how much better it would be WITH bacon as I was eating. Either way, tasty and easy. Glad to hear that you just used the vegetables you had on hand. And minimal dishes too! Thanks for letting me know! This sounds amazing! Waiting for mine to come out the oven now! Thanks for stopping by! Hope you like it as much as we do! Did you cut the chicken into pieces? Hi Renee, No. I used whole chicken thighs. However, if the thighs you are using are large, you might want to cut them so that they will cook faster and be done at the same time as the root vegetables. Great question! 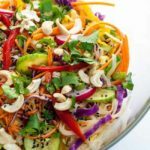 I’ve recently started doing Whole 30 and I was looking for some quick easy chicken dishes when I came across this recipe. I made it tonight and wow!! It’s so flavorful and not to mention easy. I made a few very minor changes based on the ingredients I had on hand but Whole 30 or not, this will definitely be a staple in my house! Thank you for sharing. Thanks for letting me know how much you liked it! One of the great things about sheet pan dinners is that you can adjust them based on what’s available (or what is in your fridge!) Good luck with your Whole 30. I didn’t have the chicken thighs so I opted for the boneless chicken breast. My vegetables that I shall try will be sweet potatoes, turnips, carrots, red onions, zucchini, new skin potatoes-should be interesting. Great! Hope you like it, too. Boneless chicken breasts will cook faster than bone-in chicken thighs, so you may want to reduce the oven temperature to 400 F. Also, if you’re using skinless chicken breasts, be sure to baste them part way through to keep them moist. Thanks for commenting! I plan on making this tonight. If I use bone in thighs what temp should I use? That’s what I used, too. I baked them at 425°F as in the instructions. I’ve added a note to preheat the oven to make those instructions a little more clear. Hope you love this! What about chicken legs? Do I need to adjust time or temp? Hi Donna, Great idea to use chicken legs. They should take about the same time as bone-in thighs, depending on their size–about 30 minutes. Enjoy! 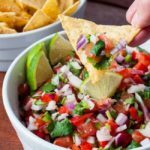 This dish is so simple and so delicious! It will be a regular on our table. Thank you so much. Thanks so much for letting me know, Ellie! So glad you liked it as much as we do! I made the sheet pan chicken and harvest vegetable for neighbors. I was reluctant about using thighs and not breasts. After reading that question in the comments I went with thighs and am so glad I did. Guests loved it and had seconds. It has plenty of flavor and the crispy thighs were nice and moist. I will definately make it again. Think I’ll add more apple as one got a little lost. Am eager to toss some Brussels Sprouts on the pan next time. So simple and so good. Thanks for letting me know, Tracey. You can’t go wrong with thighs! So glad you liked it! I made this tonight and we enjoyed it very much. However my bacon did not crisp up and stayed undercooked. I took it out and cooked it in another pan. No one else has had this issue, so I wonder where I went wrong. All in all excellent dish. The chicken was tender and everything was delicious. I’m at a loss to explain why this happened. When I make this, I put the vegetables on the sheet pan first, and the bacon on top so that it’s not at risk of cooking in the steam from the veggies. That’s the only reason I can think of that might have prevented it from becoming crisp. Rescuing it by cooking in another pan was a good solution! I like my bacon well-cooked! Glad you liked this sheet pan dinner! Thanks for letting me know. Great recipe! I used squash, zucchini, carrots, parsnip, red onion, apple, and fresh garlic for my mix and doubled the sauce so I had enough to coat what ended up as two pans of the mix with chicken pieces. Cooked for about 45 mins. So yummy! Wow! That sounds delicious. Thanks for sharing your adaptations! I have been doing the paleo diet for years now and this is the most delicious dish I have made. Wow, every bite was sooo good! Thanks so much for letting me know. This one is a favourite in our home, too. you don’t give measurements for the amount of vegetables. (Unless I just missed something in the directions?). I’m guessing 1 cup of veggies per serving? Great question! I purposely left out the amounts to use so you could adapt it to your family’s tastes. Yes, 1 to 2 cups of veggies per serving would be good, and you can add more or less of what your family likes. Don’t leave out the apple–it’s surprisingly delicious in this recipe! Thanks for your question! 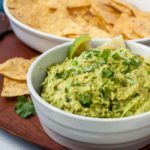 Hope you like this recipe as much as my other readers do! 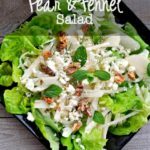 Great recipe, my family and I loved it. Will be making this again. Thanks David! Glad to hear that. It’s a favourite here, too! Can you marinade the chicken for a few hours before cooking or does that give a negative effect? Hi Zarah, Sure! That should be fine! Enjoy! I would like to make this recipe. 1 question though. Do you marinade room temperature or in the refrigerator? Hi Paul, I suggest marinating chicken in the refrigerator. Hope you love this sheet pan meal!